Hello, March! Yes, it's still freezing outside but the end of winter is in sight. I'm trying to bring myself out of hibernation so I'm setting some goals for this month. There are some things I want to be held accountable for and fun things I want to do. >> Take More Pictures - My poor camera has been neglected. When the world is grey, I have very little motivation to snap pictures of pretty things or even everyday life. I want to get back in the habit of documenting moments, even the simple ones. >> Make Ice Cream - It's been too long since I've used my ice cream maker. I'm thinking it needs to be pulled out soooooon. >> Decorate with Fresh Flowers - Spring is almost here and with spring comes flowers! I think having flowers around is just what I need to get rid of the winter blues. >> Create New Embroidery Hoops - I have ideas spinning around my head! I just need to get them stitched up. This will happen this month. Be on the lookout for new hoops listed in my shop. >> Find a Pot of Gold - Putting a St. Patrick's Day spin on this one, but one of my goals this month is to spend money frugally. We have some fun trips planned in the next few months and plane tickets are expensive. >> Exercise - Putting this one on here to hold myself accountable! Getting back into the habit of exercising has not been easy... I'm choosing to blame the weather. I have a feeling, though, that there will be some sunny days this month and I am going to take advantage of them and get outside! 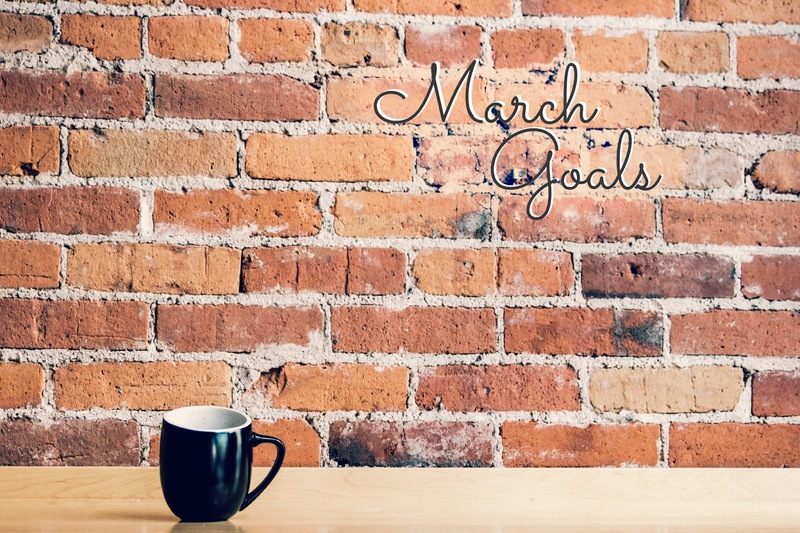 What are some things you want to accomplish this month? Good goals! I too would like to get back into the swing of working out more frequently. It's just so easy to avoid it when it's so cold and gloomy outside. I also want to spend this month getting organized; get a jump start on spring cleaning! I want to decorate more with fresh flowers as well! Ugh. Exercise is definitely on my list. I'm in the process of getting my house cleaned and organized though, so I can actually practice yoga again and maybe do some workout DVDs in our bedroom. I'm kind of obsessed with pilates. But I can't exactly do that until my house is done, and this winter I've had practically NO motivation. I hate it. I need to take more pictures also!! Also spending money frugally is one of my most elusive goals.